The 2018 Toyota Yaris iA looks like a Mazda because it is made by Mazda. This makes it a lot of fun for a Toyota. 2018 Toyota Yaris iA: A little bit of everything. Price: $17,915 as tested. No options on test vehicle. But what you get for the money is an awful lot – stability control, brake assist, traction control, rear camera, cruise, power windows and locks, Bluetooth, and Pandora. Learn to use a clutch and save $1,100. Marketer's pitch: "Style, tech and a whole lot more. Standard." Conventional wisdom: Motor Trend likes the lone trim level, two years of free maintenance, and that it's "relatively fun to drive," but not that it "struggles to maintain speed on inclines, [has] cramped rear seats, [and a] minimal effort to disguise Mazda roots." Reality: The package kind of works. Odd pedigree: The Yaris iA could give Ancestry.com a run for its money if someone were to test the lineage of this Toyota. I first experienced the tiny sedan as the Scion iA, not long before the entire division was mothballed by Toyota. But it was around far earlier than that as the Mazda2 hatchback, which is the true origin of this Toyota stepchild. A miniature Mazda from Mexico. You may see that as uptight AKC champ or an embarrassing cur. On the road: As a Mazdota, the Yaris iA outhandles most of its Toyota siblings on curves, for a tall (58.5-inch), narrow (66.7-inch), light (2,416-pound) car. There's some body roll, and I loosened one of the wheels from the road once, but all in all, some fun can be had. The Mazda cues are even more apparent inside the Toyota Yaris iA, including the stereo interface and the dashboard gauges. Driver's Seat: The seats are small and truly feel like cheap cloth, but they're not too bad for the price. They offer some support (although the headrest leans back a bit far) and didn't seem terribly narrow. A little bouncy: Drivers will eventually come to appreciate that far-away headrest, though, after trying to lean into it on a Pennsylvania highway. After feeling fillings shake and wondering about signs of a concussion, I pulled my head forward ever so slightly. The Yaris iA is a light car and jostles its occupants. Up to speed: It's also a car with a tiny 1.5-liter four-cylinder engine, and it feels like that, too. Drivers won't be thrown against that headrest during hard acceleration, as it takes the 106 horses 10.2 seconds to get the Yaris iA to 60 mph, according to Car and Driver (a stick shift blissfully whacks a second and a half off that time). Sport Drive Mode: Surprise, here's something I didn't expect to see in the Yaris iA. The little button does caffeinate the car a bit, but I wasn't a real fan of Sport mode this time around. Unfortunately, the puttputt sound emanating from the engine at idle is embarrassingly unsportmodelike. Shifty: This may only be a Mr. Driver's Seat-world problem, but I'm forever reminding myself which way to move the shifter when using the ShiftTronic levers (BMW and Mazda pull to upshift; just about everyone else pushes). Naturally a Mazdota goes the Mazda way, so I made the Yaris iA engine scream a couple of times. Play some tunes: Here's an unusual selling point – you'll get better sound from the stereo in a $16,000 Yaris iA than you will from a Lexus costing five times that. That's because Mazda engineers apparently have actual ears, and I say this as the angry owner of a Toyota Sienna with The Worst Stereo Sound in the Universe. The standing iPad look of the interface is the most obvious giveaway that this is a Mazda, and it functions as well as any. The control knob is only slightly awkward to reach, thanks to the diminutive cabin dynamics. Information, please: The gauge pod is straight out of Mazda as well. A small speedometer with a tachometer running around it livens up the center, and simple white graphics let you know about fuel economy and trip information. Friends and stuff: Six-foot-two-inches Sturgis Kid 4.0 is pretty much beyond the parameters of the backseat. This 5-foot-10-inch old man fit in just fine, but the padding itself made me a little weepy. There's a trunk with only 13.5 cubic feet of space, which makes the Yaris iA less than practical. Fuel economy: There may be downsides to the Yaris iA, but you'll feel better about all the gasoline you don't buy. I averaged almost 37 mpg in the usual Mr. Driver's Seat round of highway and country-road testing. Where it's built: Salamanca, Mexico. How it's built: It gets a top reliability rating from Consumer Reports. 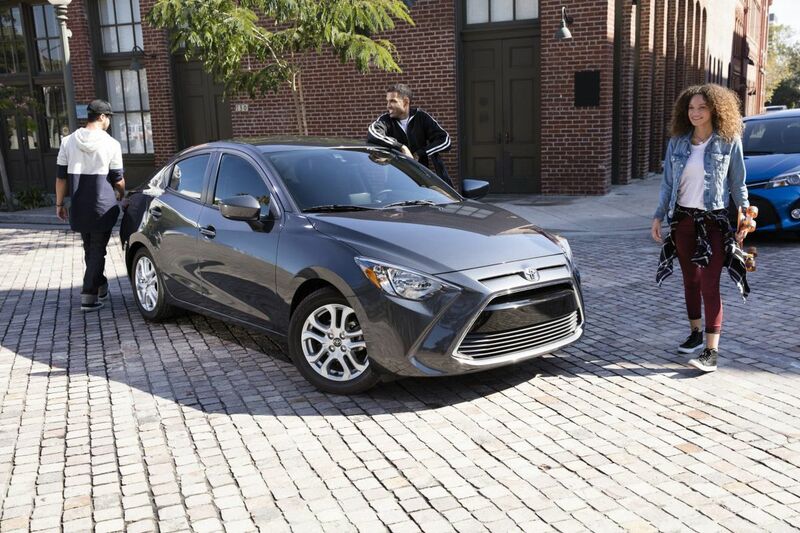 In the end: The Yaris iA offers a lot of fun and dependability for a low entry fee.